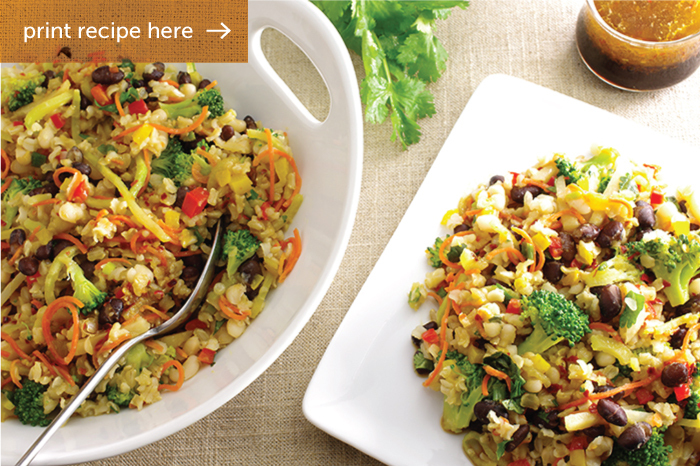 A colorful collection of vegetables stars in this recipe along with whole-grain brown rice. 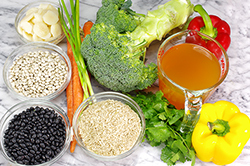 The nutritional power of beans anchors the assortment along with the cruciferous clout of broccoli, beta-carotene-packed carrots and a host of other colorful cohorts. Each player adds their own unique flavor to the dish while the sesame-ginger vinaigrette ties it all together. 2. Using a 2:1 liquid-to-grain ratio, cook the brown rice in vegetable stock (or lightly salted water) until tender, about 35-45 minutes. 3. 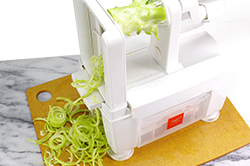 Meanwhile, prepare the vegetables including spiralizing the broccoli stalk using a “spaghetti-sized” blade. 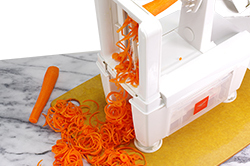 Also, spiralize the carrots using an “angel hair-sized” blade. Dice the red and yellow bell peppers, and slice the scallions. 4. 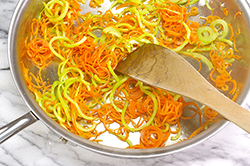 Sauté the broccoli stalk spirals and carrots in a sauté pan with the olive oil for 3-4 minutes, add the broccoli florets, diced bell peppers, scallions, and water chestnuts. 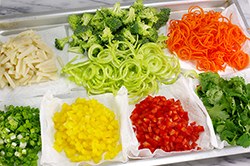 Continue to sauté until the vegetables are just tender, but still brightly colored. 5. Add the cooked rice, beans, and cilantro leaves to vegetables and toss to combine. 6. 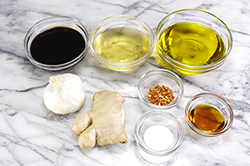 Prepare the dressing by whisking together the rice vinegar, soy sauce, crushed garlic, grated ginger, sesame oil, sugar, and red pepper flakes. Gradually drizzle in the olive oil while continuing to whisk. Or, place all ingredients in a salad shaker or jar, and shake vigorously. 7. 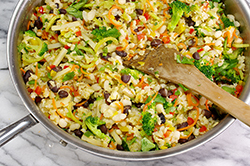 Drizzle half the dressing over the rice and vegetables, toss again to combine. Serve the remaining dressing on the side.